← A personal academic milestone! Abraham Merritt (1888-1943) was one of the greats of pulp fiction, although up until recently his work was largely forgotten. Recently, two of his novels were reprinted, The Moon Pool (1919) and The Metal Monster (1920), both of which I’ve blogged about in some detail. I found The Moon Pool, on the whole, a rather ordinary pulp adventure novel punctuated by scenes of brilliant weirdness, while The Metal Monster was a truly unique masterpiece of weird fiction. The story follows the experiences of an American explorer, Leif Langdon, and his Cherokee friend and traveling companion James T. Eagles, aka Tsantawu. The novel begins in the wilds of Alaska in the summertime, where Leif and Jim are ostensibly searching for gold but really just seeking solitude. One evening, the sound of ominous drums reach their ears from the north. The drummings are chillingly similar to those Leif encountered during a horrifying experience on an adventure in Mongolia several years earlier — the experience that Leif’s trip to Alaska was supposed to help him forget. Pressed by Jim, Leif explains how he encountered a tribe of sinister, primitive Mongols in the mountains of Mongolia. This tribe was convinced that Leif was a reincarnation of their greatest warrior, the evil Dwayanu, who had carved out an empire in the name of their god Khalk’ru. Leif manages to escape the Mongols, but not before being psychologically scarred by a terrible experience. We tramped across the top toward a line of huge boulders that stretched like a wall before us. We squeezed between two of these, and drew hastily back. We were standing at the edge of a precipice that dropped hundreds of feet sheer to the floor of a singular valley. The jumble of snow-and-ice-mantled mountains clustered around it. At its far end, perhaps twenty miles away, was a pyramidal-shaped peak. Down its centre, from tip to the floor of the valley, ran a glittering white streak, without question a glacier filling a chasm which split the mountain as evenly as though it had been made by a single sword stroke. The valley was not wide, not more than five miles, I estimated, at its widest point. A long and narrow valley, its far end stoppered by the glacier-cleft giant, its sides the walls of the other mountains, dropping, except here and there where there had been falls of rock, as precipitously into it as the cliff under us. But it was the floor of the valley itself that riveted our attention. It seemed nothing but a tremendous level field covered with rocky rubble. At the far end, the glacier ran through this rubble for half the length of the valley. There was no trace of vegetation among the littered rocks. There was no hint of green upon the surrounding mountains; only the bare black cliffs with their ice and snow-filled gashes. It was a valley of desolation. We began the descent. I was scrambling over one of the rocks about a third of the way when I heard his sharp exclamation. Gone was the glacier that had thrust its white tongue in among the rubble. Gone was the rubble. Toward its far end, the valley’s floor was covered with scores of pyramidal black stones, each marked down its centre with a streak of glistening white. They stood in ranks, spaced regularly, like the dolmens of the Druids. They marched half-down the valley. Here and there between them arose wisps of white steam, like smokes of sacrifices. Between them and us, lapping at the black cliffs, was a blue and rippling lake! It filled the lower valley from side to side. It rippled over the edges of the shattered rocks still far below us. Then something about the marshalled ranks of black stones struck me. once more the rubble-covered floor of the valley. There had been an odd touch of legerdemain about the transformations, like the swift work of a master magician. And it had been magic–of a kind. But I had watched nature perform that magic before. In my figure, the light ray reflected off of Khalk’ru on the other side of the valley is bent in such a way that makes it appear that a Khalk’ru is in the valley itself, as well as being on the other side! In the case of Jim and Leif, they apparently see images of the distant mountains and sky in place of the actual contents of the valley. The mirage hides a lush forested valley teeming with life. Leif and Jim descend into it and quickly fall in with a friendly tribe of pygmies, and their leader, the alluring lady Evalie. The pygmies hold an uneasy truce with the empire across the river, which consists of the human followers of Khalk’ru — including the beautiful and amoral witch-woman Lur and the brutal warrior Tibur. The early parts of the novel I found, quite frankly, a little unenthralling. However, things change dramatically and the story takes a dark turn when Leif falls into the hands of the worshippers of Khalk’ru. He finds himself in a struggle for supremacy in his own mind against his murderous ancestor Dwayanu, and commits horrible acts while under his influence. The rather grim nature of this latter part of the book is in stark contrast to the typical pulp fiction clichés, and is more in line with the dark ‘sword and sorcery’ fantasy of Robert E. Howard. It is certainly conceivable that Merritt was inspired by the gritty nature of Howard’s work: REH would publish his first sword and sorcery tale, featuring the barbarian king Kull, in 1929. The story was a hit and likely Merritt would have been aware of it and influenced by it. On the Lovecraft side, Khalk’ru is obviously inspired by Lovecraft’s octopus-like deity Cthulhu. This certainly wasn’t an instance of plagarism: Lovecraft encouraged the mutual exchange of concepts and deities between writers of weird fiction, which built up a quasi-consistent mythology (now typically called the Cthulhu mythos) which spread over the works of many different authors. Dwayanu had had his doubts about that dread Thing being any Spirit of the Void, and I, who now was Leif Langdon and a passive Dwayanu, had no doubts whatever that it was not. Yet I could not accept Barr’s theory of mass hypnotism–and trickery was out of the question. Whatever Khalk’ru might be, Khalk’ru–as the Witch-woman had said–was. Or at least that Shape which became material through ritual, ring and screen–was. No, whatever the Thing was, no matter how repugnant to science its recognition as a reality might be–still it was Atavism, superstition–call it what Barr would–I knew the Thing was real! Not of this earth–no, most certainly not of this earth. Not even supernatural. Or rather, supernatural only insofar as it might come from another dimension or even another world which our five senses could not encompass. And I reflected, now, that science and religion are really blood brothers, which is largely why they hate each other so, that scientists and religionists are quite alike in their dogmatism, their intolerance, and that every bitter battle of religion over some interpretation of creed or cult has its parallel in battles of science over a bone or rock. Yet just as there are men in the churches whose minds have not become religiously fossilized, so there are men in the laboratories whose minds have not become scientifically fossilized…Einstein, who dared challenge all conceptions of space and time with his four dimensional space in which time itself was a dimension, and who followed that with proof of five dimensional space instead of the four which are all our senses can apprehend, and which apprehends one of them wrongly…the possibility of a dozen worlds spinning interlocked with this one…in the same space…the energy which we call matter of each of them keyed to the different vibration, and each utterly unaware of the other…and utterly overturning the old axiom that two bodies cannot occupy the same place at the same time. And I thought–what if far and far back in time, a scientist of that day, one of the Ayjir people, had discovered all that! Had discovered the fifth dimension beyond length, breadth, thickness and time. Or had discovered one of those interlocking worlds whose matter streams through the interstices of the matter of ours. And discovering dimension or world, had found the way to make dwellers in that dimension or that other world both aware of and manifest to those of this. By sound and gesture, by ring and screen, had made a gateway through which such dwellers could come–or at least, appear! And then what a weapon this discoverer had–what a weapon the inevitable priests of that Thing would have! And did have ages gone, just as they had here in Karak. If so, was it one dweller or many who lurked in those gateways for its drink of life? The memories bequeathed me by Dwayanu told me there had been other temples in Ayjirland besides that one of the oasis. Was it the same Being that appeared in each? Was the Shape that came from the shattered stone of the oasis the same that had fed in the temple of the mirage? Or were there many of them–dwellers in other dimension or other world–avidly answering the summons? Nor was it necessarily true that in their own place these Things had the form of the Kraken. That might be the shape, through purely natural laws, which entrance into this world forced upon them. I love Merritt’s argument that the ‘supernatural’ being Khalk’ru was really in fact a being subject to (as yet not understood) natural laws. As a scientist, though, I take issue with the notion that “scientists and religionists are quite alike in their dogmatism.” The example cited by Merritt — Einstein’s relativity — actually serves as a partial counterexample to his assertion. Though Einstein’s theory was not universally accepted or understood when it first appeared, it seems to have won very rapid acceptance in the scientific community in spite of its nearly complete reworkings of conventional notions of space and time. I really had a delightful time — seeing all the old gang… But the meeting which will interest you most is that with A. Merritt, the Moon Pool man. It seems he had long known my work and held a very kindly opinion of it. Hearing of my presence in NY he took steps to get in touch with me, and finally invited me to dinner at his club — the Players, which occupies Edwin Booth’s old home in Gramercy Park. Merritt is a stout, sandy, grey-eyed man of about 45 or 50 — extremely pleasant and genial, and a brilliant and well-informed conversationalist on all subjects. He is associate editor of Hearst’s American Weekly, but all his main interests centre in his weird writing. He agrees with me that the original Moon Pool novelette in the All-Story is his best work. Just now he is doing a sequel to Burn, Witch, Burn (which I haven’t read, but which he says he’ll send me), whose locale will be the fabulous sunken city of Ys, off the coast of Brittany. It will bring in the comparatively little-known legendry of shadow-magic. Merritt has a wide acquaintance among mystical enthusiasts, and is a close friend of old Nicholas Roerich, the Russian painter whose weird Thibetan landscapes I have so long admired. I was extremely glad to meet Merritt in person, for I have admired his work for 15 years. He has certain defects — caused by catering to a popular audience — but for all that he is the most poignant and distinctive fantaisiste now contributing to the pulps. As I mentioned some time ago — when you lent me the Mirage installment — he has a peculiar power of working up an atmosphere and investing a region with an aura of unholy dread. About that composite story — my section does not conclude it. It is a five-author affair, in the following order: Moore, Merritt, HPL, Two-Gun Bob, Frank B. Long. My section was probably the most difficult, since I had to plan out the general rationale and plot of the whole thing. All that Miss Moore and Abie did was to sketch out the background and plaster on atmosphere. There was no story up to the point where I was expected to begin, and at that stage (the third instalment out of five – i.e. the central section) it was imperative that somebody start something and give an idea of what it was all about. I fear I made a mess of it. The assignment reached me just as I was leaving St. Augustine, and I did the job in odd moments of Charleston sight-seeing. There was no chance for original creation, so I fell very reprehensibly inot a hackneyed pattern. I surely hope that no one will judge me by this attempt! Amusingly enough, Abe Merritt very boldly dodged the hard job of a central assignment. Schwartz had originally given Long the second part to do, and Belknap had prepared a rather clever development. That put Merritt third – where he would have had to build from Long’s section. Well -when it came to that, he squirmed out in what both Long and I (and the Wandreis and others as well) think was a distinctly unsportsmanlike way. Claiming that Long had veered away from the subject-matter specified in the title, he refused to “play” unless Schwartz would kill Belknap’s section and give him second place! “Two-Gun Bob” is Texan Robert E. Howard, if you hadn’t figured that out! Returning to Dwellers, I have a hard time deciding how much I liked it in the end. It is still, at heart, a very familiar ‘planet fantasy’-style pulp adventure, but with atmospheric touches that give it a flavor of Lovecraft and Howard. The novel was enjoyable to read, but not of the same haunting quality which I found The Metal Monster. The inner conflict of the story’s hero, however, provides a depth and darkness not found in other pulp adventures of the time, including Merritt’s own Moon Pool. In the end, I guess you can decide for yourself! Dwellers in the Mirage is available to read via Project Gutenberg. If you so indulge, let me know what you think! This entry was posted in Adventure fiction, Lovecraft, Robert E. Howard, Weird fiction. Bookmark the permalink. I wonder if a monster named “Chalk”-ru makes noises like the sound of fingernails on a blackboard. 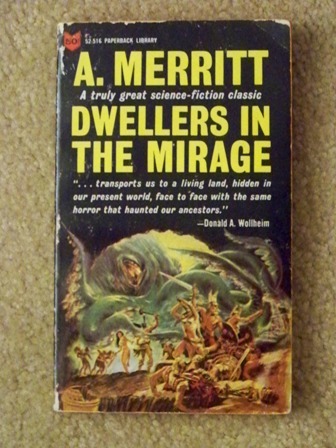 You might also enjoy “The Face in the Abyss” and “The Shop of Ishtar” – both pretty standard pulp fare heightened by Merritt’s vivid imagination. DitM was serialized literally just a month or two before Howard CREATED Conan. That is likely not a coincidence anymore than Howard created Kull fairly soon after THE SHIP OF ISHTAR was published. Compare Conan to Kull, personality-wise, then compare Conan to Dwayanu. We know Howard was a Merritt fan.